The Door Knocker Room has largest collection of door knockers in Canada. We always have over 100 styles to choose from. We import from 7 different countries. This gives us an incredible selection of styles and materials. Brass, iron and bronze are all here. We have everything from fanciful mermaid door knockers to hand wrought iron copies of door knockers from England and Europe. We even have one hand made right here in Elora. 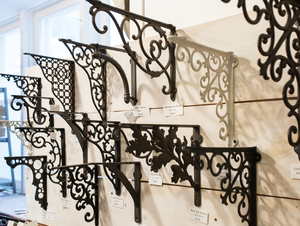 We have a good selection of hand-wrought iron door fittings to help give your home a fabulous old-world feel. Mail Boxes. Give your house a Euro feel with our amazing mail boxes. A variety of sizes and colours are available.